Now that my warning is out of the way, let’s move on the important things. WHO IS ON THE DANG AIRPLANE?!?! —> This is the question plaguing me (and all E.K. Blair fans) since the end of Echo. I’m not going to ruin it for you but rest easy because we find out pretty much immediately who our mystery person is and this person really sets the tone for the rest of the book. And of course because of that, I really can’t go into details about the plot. This is definitely a book you have to experience with as little knowledge of the story going in as possible. The whole series really. I never figured this series would have a traditional happy ending as The Black Lotus books are not what I would classify as romance. There’s a love story to be sure but the focus is really on Elizabeth and her past and specifically her thirst for revenge. This is probably the darkest series I have ever read and I’ve loved every twisted second of it. All I wanted was for Elizabeth to come to some realization that she is worth loving and for her to begin to heal from her past. Of course with the way this series has gone, that’s a pretty tall order. I will say I got what I wanted in some form or fashion and despite the book totally destroying me, I am happy with the ending and felt it fit with the rest of the series. The irony is really pretty perfect. When I reflect on this series, I think the biggest applause I can give E.K. Blair is that she took characters that are essentially pretty unlikeable, made me sympathize with them and them wove a story that still drew me in and kept me wanting more. Elizabeth is not your typical heroine in any way, shape or form. And Declan is a good guy but his relationship with Elizabeth really did kind of ruin him. Whether that’s a good thing or bad thing is probably debatable. But what isn’t debatable is their love. It’s ugly, it’s passionate, it’s not always healthy but it’s there. So for me, I wanted Hush to allow these characters to fully love each other despite the past and their obstacles. But… you’ll have to read and see for yourself whether that happens or not. Everything I was hoping it would be… and more! For those of us on the edge of our seats since reading Bang, Echo delivers a powerful punch right the gut and the heart. Who is dead? Who is alive? What on earth is going to happen next? Well, you’ll get no spoilers out of me but trust me. Read. It. Now! E.k. gives us answers to several questions fairly quickly. Another intricate plot is woven after the events of Bang and we realize the depth people will go to cover their sins. Are all of the questions answered? No. There will be a third book and this series is so freaking amazing, I don’t even mind waiting. A good book is a good book and this is a great one. 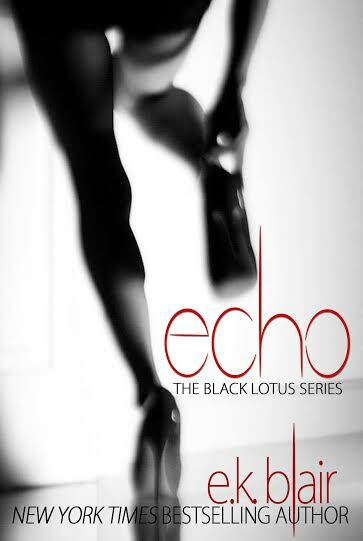 Every bit as twisted and dark as Bang, Echo is not easy to read. Abuse (physical, emotional and sexual) and violence are part of this story and part of the character’s lives. E.k. 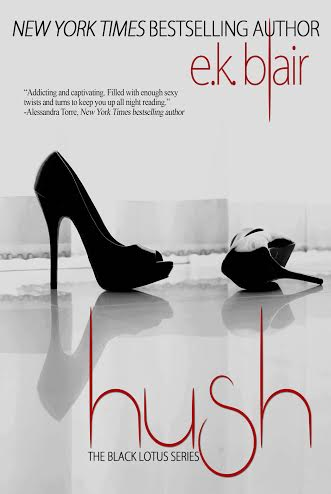 Blair does dark and twisted like no other and while I can’t always read and enjoy dark romance, E.k. makes me love hers. The plot is intricate so you have to pay attention to the story. But when it all comes together, you get that WOW moment. Character development and writing style are great and the author really knows how to keep the angst going. I definitely recommend this series if you think you can deal with some pretty descriptive dark romance! **If you haven’t started the series, grab your copy of Bang today for only 99 cents! 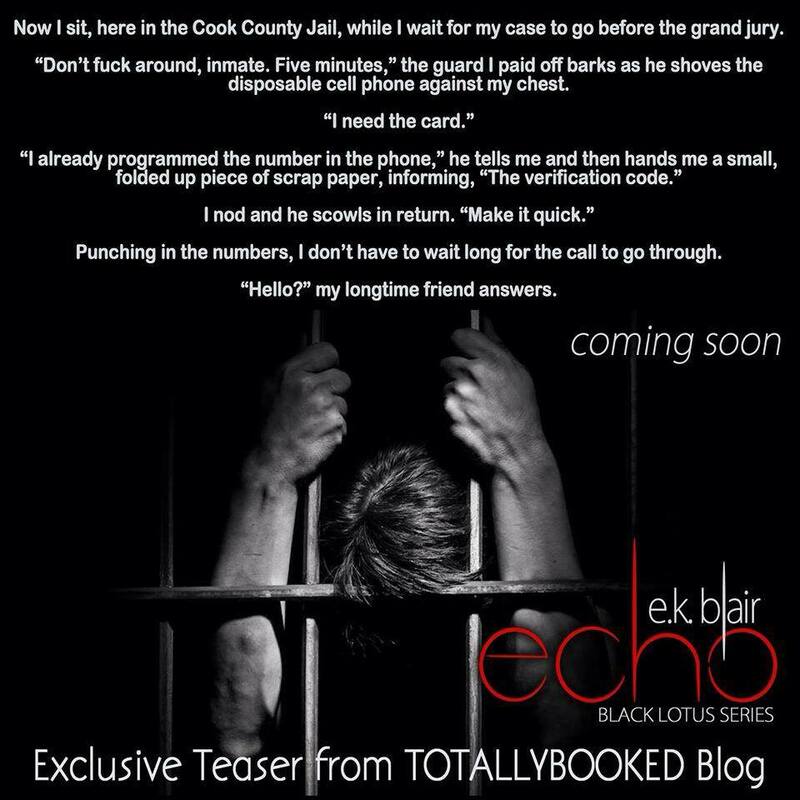 We are so very excited to bring the release of Echo (Black Lotus #2) by E.k. Blair. If you have read Bang, then you’ve been anxiously waiting for this! If you haven’t read Bang, then I suggest you get to it immediately as it’s on sale for only 99 cents. This series is by far my favorite dark and twisted romance. It’s been said the longest echo ever measured lasted 75 seconds, but I can assure you, this will last much longer. The bang deafened the world around me, muting everything into nullity, allowing the reflection of its destruction to live far beyond its intended life.It will follow me forever, destroying me—destroying you. If you haven’t read Bang (Black Lotus #1), check it out today. The series must be read in order.